Eric Lamaze and Houston. Photos © Sportfot. Wellington, FL – January 26, 2017 – Canada’s 2008 Olympic Champion and 2016 Olympic Individual Bronze Medalist Eric Lamaze took top prize in Thursday’s $35,000 Ruby et Violette WEF Challenge Cup Round 3 riding Houston at the 2017 Winter Equestrian Festival (WEF) in Wellington, FL. Belgium’s Luc Musette set the course for 79 starters at the Palm Beach International Equestrian Center (PBIEC) on Thursday, with 15 entries qualifying for the jump-off, and 13 moving on to the short course. The jump-off had three clear rounds, the first of which was set by Molly Ashe (USA) and Maarten Huygen’s Audi’s Dimple in 42.60 seconds. Leslie Howard (USA) and GJ Stable’s Gentille van Spieveld followed, crossing the timers in 41.38 seconds. Lamaze with Artisan Farms and Torrey Pines Stable’s Houston then took the lead in 40.55 seconds. Houston, a ten-year-old Belgian Warmblood stallion (Heartbreaker x Corofino), is an up-and-coming mount for Lamaze that was purchased by Artisan Farms at the start of 2015. The young horse has steadily progressed and ended the 2016 season with clear rounds at both the La Coruña CSI 4* and Stephex Masters CSI 5* events. Lauren Hough (USA) and Sergio Alvarez Moya (ESP) were each faster than Lamaze in the jump-off, but incurred four faults. Hough’s time of 39.49 seconds placed fourth with Laura and Meredith Mateo’s Waterford. Moya took fifth place with his time of 40.11 seconds riding G&C Unicstar de l’Aumone. Also competing in the International Arena on Thursday, Darragh Kenny (IRL) and Vlock Show Stables’ Cream Caramel won the $8,000 Douglas Elliman 1.45m jump-off class. Kelley Farmer, of Keswick, VA, and Because, owned by Jane Gaston, were almost flawless in the Equine Tack & Nutritionals Green Hunter 3’9″ division. The pair won all four over fences classes and placed fourth under saddle for the championship title. Farmer and Because earned an impressive 96 in the stake and a pair of 90s in the over fences classes. Because is a coming ten-year-old KWPN stallion by Verdi that Gaston purchased almost a year ago from Daniel Geitner. Both Gaston and Farmer earned coveted tri-color ribbons with Because during the 2016 indoor finals circuit. Most recently, during WEF 2, Farmer and Because were also named champions of the Green Hunter 3’9″ division with notable scores of 94, 92, and 90. Gaston and Because were also named reserve champion of the Hunt Ltd. Amateur-Owner Over 35 division during week two. 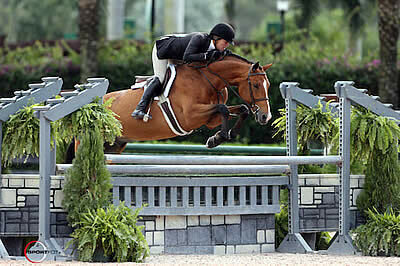 Scott Stewart, of Wellington, FL, guided Fashion Farm’s Captivate to the reserve championship. The pair placed first under saddle, second in the handy, third in the stake, and third and fourth over fences. Captivate is a 2009 Westphalian gelding by Captain Fire that Stewart has ridden since April of 2015. The third week of WEF continues on Friday featuring the FEI $35,000 Illustrated Properties 1.45m in the International Arena. Also on Friday, the Triple Crown Blankets Adult Amateur Hunter 36-49 Section A championship will be decided. For full results, please visit www.PBIEC.com.